Yumi London, Layered Gold-thread Print dress is perfect for your next summer wedding or just a night-out. 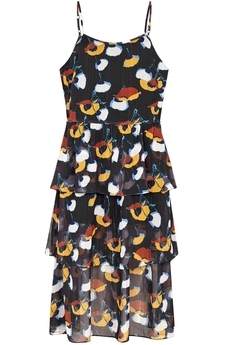 Beautifully cut from semi-sheer light-weight fabric adorned with golden threads and bold florals, it falls in ruffles from the waistline to just under the knee. Style it with your high-heel sandals and with the matching trench-coat. It simply slips on, has adjustable straps, it is partially lined and is approx. 115cm in length. Summer collection. Composition: 100% Polyester. Color: Black.